John Abbott – John G Abbott was a maker of banjos from about 1890 and sold under his own name and made for other firms and teachers (e.g. Barnes & Mullins, John Alvey Turner, Norton Greenop, Charles Skinner. Len Shevill, G. Scarth).When Barnes &, Mullins came to London in 1901, and soon after, started their own workshops at Harrow, Middx. John G. Abbott supervised the making of the Barnes & Mullins banjos and zither-banjos. In 1905 he left Barnes & Mullins to form his own company with the title of J. G. Abbott & Co. and a factory at 97/99 Hampstead Road, London, NW1. When George Scarth abandoned his violin-importing business and took over the general music shop at 69 Charing Cross Road, London, in 1929 he was at first content to sell the occasional banjo which he would obtain from his usual wholesaler. However, in 1931 he decided to launch his own brand of banjo and the first Scarth banjos were designed and made for him by Robert (“Bob”) Blake. When the demand for these high-class instruments increased, J. G. Abbott was called upon to also fabricate for him. Scarth banjos ranged from an inexpensive model to a really high-class expensive instrument: the “Model B2” being a good copy of the American “Vegavox.” None of the instruments he sold bear the name Scarth, but they can be identified by the old-English letter “S” (made of mother-of-pearl) inlaid in the pegheads. No Scarth banjos were made after 1936. when the demand was more for plectrum guitars. By this time the firm moved 55 Charing Cross Road. John George Abbott (1877-1938) was born in Poplar, London and was a cabinet maker by trade. By the end of the century. Musicians who were ‘getting into’ banjos around the turn of the century, were looking for skilled craftsmen to make instruments. Fortunately, they found John Abbott. In 1901 he went to supervise the production of Barnes & Mullins banjos at their factory in Harrow. When he left in 1905, he started his own company J G Abbott & Co in 97/99 Hampstead Road, London NW1. He made banjos under his own name and for several of the other ‘names’ in the banjo business such as Norton Greenop, Charles Skinner, John Alvey Turner and Len Shevill. It is not uncommon to find an Abbott-made banjo of this era branded by another firm such as Hawkes. There were 2 main makes of banjo – an ordinary Abbott banjo in 3 grades with grade 1 being the best and a more expensive banjo named either the Monarch or the Mirabile depending on the type which was also graded by decoration and quality. 1905 was also the year that his son was born. He was also called John George, just as his father and grandfather had been – there were 3 generations of John George Abbott living at this point in time. About 1928 his workshops were transferred to 44 Chalton Street, Euston Road (where his son Jack (1905-1994) learned the art of instrument making) and 4 years later he became, part of the Besson Co., when his works were transferred to Besson’s premises at Stanhope Place, Marble Arch, London, when the making of banjos virtually ceased, his activities being devoted to making plectrum guitars (sold under the brand of “Aristone“). The instruments they made were grouped under the general names of “Mirabile” (banjos), “Monarch” (plectrum-banjo and tenor-banjos) and Amboyna” (Zither-banjos). About 1928 his workshops were transferred to 44 Chalton Street, Euston Road (where his son-learned the art of instrument making) and 4 years later he became, part of the Besson Co., when his works were transferred to Besson’s premises at Stanhope Place, Marble Arch, London, when the making of banjos virtually ceased, his activities being devoted to making plectrum guitars (sold under the brand of “Aristone“). In 1936 he suffered from serious internal organ trouble from which he never fully recovered. He died on February 11, 1938 after a brief illness. John (Jack) G Abbott – son learned the craft of instrument making in his father’s workshops. When his father joined Besson & Co. in 1932, he established his own one room work-shops at various addresses in London for the making of, mostly, guitars. He did make a few banjos which were branded ‘Abbott-Victor’. He gave up the business in 1957. Image above of Ronnie Wood’s (Rolling Stones, Faces) 1931 John George Abbott guitar – (not to be confused with Victor Abbots) it is a 1931 Musicmaster The headstock is the giveaway it is a HUGE 8.5in x 4.5in the guitar is a massive 18″ wide body and is made from solid Maple with a carved Spruce top and a 20 fret Ebony fretboard. The three neck guitar in the clip is an ABBOTT . When John G Abbott grew ill in 1936 and gave up the business, Jack started on his own producing guitars, occasional banjos and banjo ukuleles. Around this time, Besson’s acquired J G Abbott & Co.
As John junior, or Jack as he became known to distinguish him from his father, grew up, he learnt the trade of instrument making and for a period of time in the late 1920s and during the 1930s both men worked together producing guitars, banjos and banjo ukuleles at their workshop in London which had moved in 1928 to Chalton Street. During this era, it is possible to confuse the attribution of a particular Abbott instrument but those in the trade can spot the tell-tale differences in workmanship between father and son. Jack Abbott Jr was the very 1st British Luthier who built archtops. It seems he become a real expert and made very good instruments. He mainly built banjos but a few guitars as well. His production was not very big so Abbott Guitars are really hard to find. At some point after the war he was associated with someone called Victor and designed and supervised a series of guitars branded Abbott-Victor. Jack continued making instruments until the mid 1950s when he retired and returned to the London Stock Exchange which suggests that he initially trained for and worked there before becoming an instrument maker. He also moved out of London to Cambridgeshire where he was persuaded out of retirement in 1970 to make around 200 banjo ukuleles for the George Formby Society over the next 8 years. Jack died in February 1994 and was survived by his wife Barbara. Vintage guitars made by master luthier J G Abbott senior in London 1930’s. At least as good as a top line Gibson of the period. Many people only know about the later 1950‘s low end plywood guitars built by Besson using the Aristone brand name, which they co owned with Abbott from the 1920’s. The 1950’s guitars are very poor in comparison and more like a Framus or Hofner. These 1930’s Aristone Crown models are the very best of J G Abbott Sr’s production, from the mid 1930‘s. The build is similar to a D’Angellico, hand carved spruce top, hand carved one piece back, one piece neck (no wings added for the headstock, just a single billet of the best quality mahogany available), gold hardware, 7/9 ply top binding, mother of pearl inlays, bound neck and F holes. They sound as good as a D’angellico too! Not to be confused with the guitars of J G Abbott Jr who also made very good guitars, but not quite as good as these. Abbott Victor Burlington by J G Abbott junior made in 1940 which is very good but not a patch on the Aristone. A very rare guitar with huge tone and volume eats L-5’s and Super 400’s for breakfast! Finch from Maton refinish the guitar in Black about 20 years ago and several years before that Rama guitars installed a low-output humbucker. During the refit all the metal parts were 24k Gold plated and replaced the tuners with sealed Schallers. So much for originality. 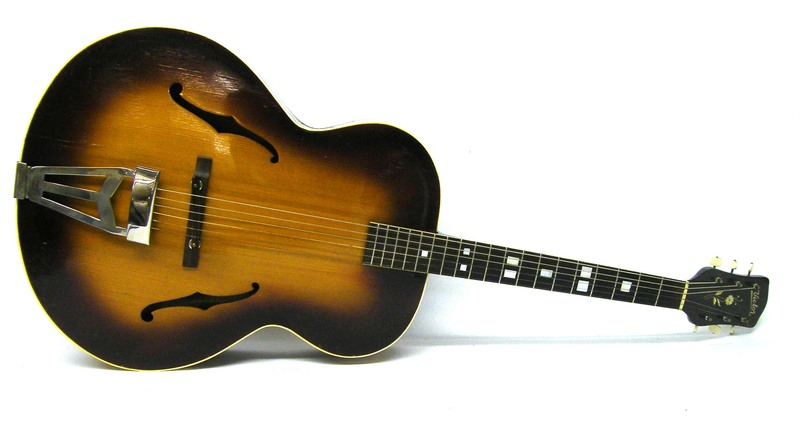 It is one of the sweetest playing guitars from the early 1930‘s. The neck is medium (not too fat, not too thin – and the frets are original. The neck is dead straight and the action is faster that one would expect on a guitar from the ‘30‘s. 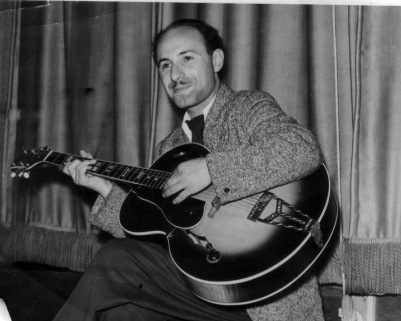 Bert Weedon was a proud owner of an Abbott-Victor Archtop which he used on many broadcasts. In 1945 Bert was honoured to succeed Django Reinhardt – one of his own idols – in a partnership with jazz violinist Stephane Grappelli that lasted for several years. Bert Weedon – Victor Ritz arch top acoustic guitar, 19 fret rosewood fingerboard with pearl block position markers, burst finish, hollow body, hard case. 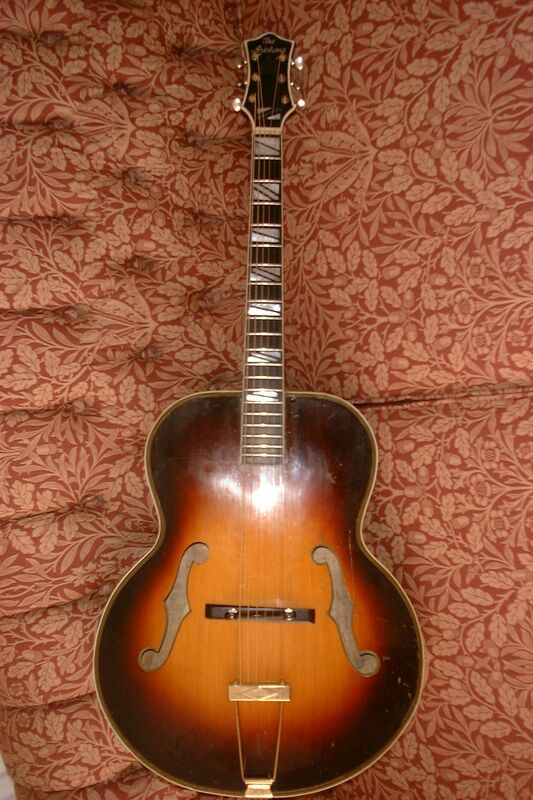 This guitar was used by Bert in many radio recordings between 1946 – 48. Bert Weedon traded this guitar back to Jack Abbott for the top of the range Music Master model. That model along with several other iconic instruments associated with Bert Weedon all remain with the family. The guitar was sold to a pupil of Bert’s in 1950. This Abbott Victor Archtop Guitar played by southpaw Al Ferdman has an added pickup masked by his left hand, with the Volume control and Jack socket on the F-hole and an Abbott Victor engraved Y trapeze. Block inlays to the fretboard and a scratch-plate with binding. Could be a Music Master edition.